Blondie and I started the day with a walk along the Yukon River. During the Klondike Gold Rush, prospectors traveled up the Yukon river to Dawson city by riverboat. In Dawson City it’s all about the gold. To learn more about the gold rush history and see where gold was first discovered here we drove along Bonanza Creek Road to take a walk on the Discovery Claim trail. Descriptive signs and old gold mining equipment line the trail beside Bonanza Creek where gold was discovered in 1896. An area designated as a free claim area gives anyone access to pan for gold here. If you pan elsewhere you may be claim jumping. What better way to celebrate my birthday than to pan for a little gold? I learned how to pan for gold from a very patient teacher at Claim 33. A drive to the top of Dome Road for a view of the city and the Yukon River was our next adventure of the day. The road is steep and narrow with many sharp turns. Bicyclists were also making the trek up the hill. When we got to the top to look around, they went down the mountain on one of the narrow trails. Next, a stop at the Robert Service Cabin was in order. Robert Service is a famous poet who lived for a time in the Yukon. My brother Joe gave us a book with a collection of his poems for Christmas and we have been reading it as we have been traveling. “The Cremation of Sam McGee” is one of our favorites. Click on the link to read the poem. 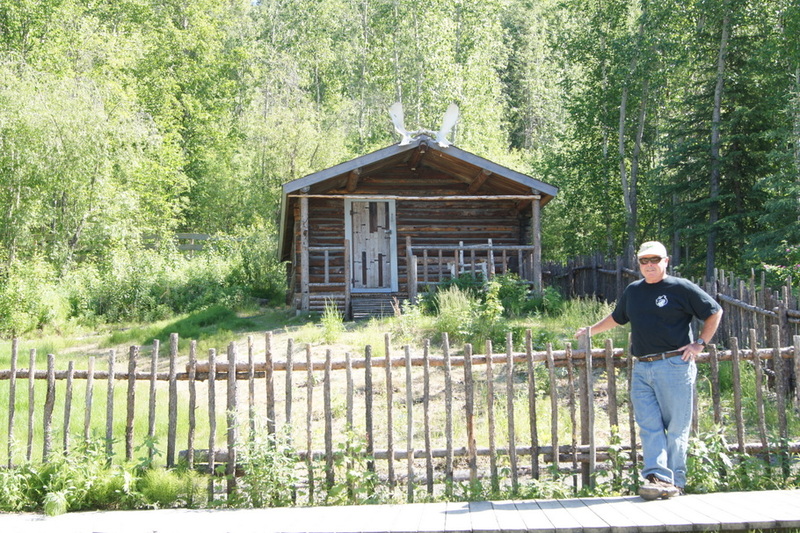 Jack London, author of “The Call of the Wild” also lived in Dawson City. After visiting with our neighbors from BC in the campground for a little while, we had a birthday dinner at Sourdough Joe’s. Ice cream for dessert was perfect after a hard day of being a tourist so we walked next door to an ice cream shop. Henry had on a Tybee Island Pirate Fest t-shirt and as we were standing in line to order a young man behind us commented that he had been to Tybee Island. Of course we started talking to him and asked him where he was from. When he replied “Nova Scotia” we asked what brought him to Dawson City on the other side of the continent from his home. He told us he was working at a small gold mine in Dawson City. The idea that someone from Nova Scotia who was working in Dawson City had actually been to Tybee Island just blew me away.